How We Declared Secondhand Smoke a Nuisance. 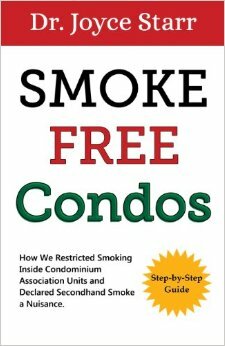 Do you long for a smoke free condominium? Do you wish you could convince your condo board to restrict smoking inside units? Finally, a step-by-step guide. This book could save your condo thousands of dollars in legal fees. Starr addresses recent case and state law on secondhand smoke, the Law of Nuisance, Quiet Enjoyment of Property and amendment procedures. She describes key tasks, amendment milestones, the importance of the right attorney and costs. Smoke-Free Condos is a critical guide for condo owners suffering from secondhand smoke, condo association and homeowners association boards, law firms, nonprofit organizations promoting smoke-free policies and government agencies. The author fought a four year battle against secondhand smoke in her condo association. After numerous setbacks, she was elected to her condo board, and thereafter as treasurer, where she led the effort to amend the Declaration to restrict smoking inside units and to define secondhand smoke as a nuisance. A single misstep could have undermined the entire endeavor. According to available records, her medium-sized complex was the first in Florida to amend the Governing Declaration for this purpose. The challenges and hurdles faced – and overcome – are vividly presented. Smoke-free condo advocates typically confront fierce opposition, including personal threats. For the author, backing down or letting others undermine the goal was not an option. Prior foes became supporters and one determined ally helped bring the vote across the finish line. Smoke-Free Condos is a must-have guide for smoke free living in multifamily housing. Author of 17 books, Dr. Joyce Starr is a sought-after condo rights expert and public speaker. Her works include: Defend Your Condo & Homeowner Rights and Secondhand Smoke Crimes.